Special Education Visual MEGA Bundle! Cards, Posters, Forms, Clip-Art, and MORE! Special Education Visual Resource BUNDLE! 130 Ct. Posters, Cards, & More! 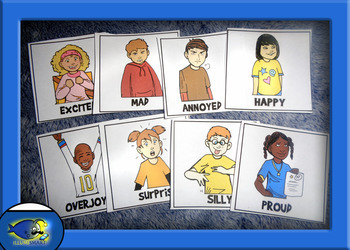 Special Education and Calm Down Visual Resource Kits BUNDLE! For Older Kids! Everyone has feelings, but these unique and lively cards will help make it easier for your students to interpret, identify, manage, and understand. While these cards were designed with autistic/special ed. populations in mind, there are many ways they can be used! Cards are in color on pngs. 300 dpi. (12 Cards/page). Individual card size is about 2.5" by 2.5". Visuals feature children from about 3rd to 6th grade. Great for special education teachers and school counselors! This resource is part of the MEGA Visual Special Education Bundle. BIG VALUE! *give to students so they can keep them in their backpack/binder and place a card on their desk/hand it to you to show how they are currently feeling without speaking or disrupting a lesson. *print for projects, collages,and your own activities. *create your own games and classroom projects. 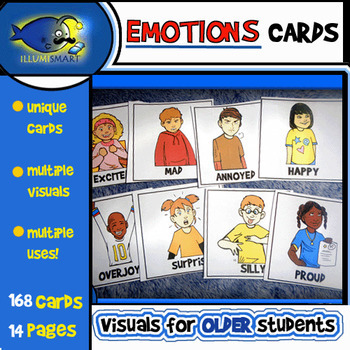 This product (Emotions Cards) may be used for personal, educational, and non-commercial use. This bundle/images contained is for private/classroom use only. Please consider purchasing Illumismart Clip-Art for your TPT products. Individuals may not remove images from the guide or sell/resell/distribute the clip art individually or in bundled packets. This visual may not be distributed on any site, for profit or non-profit use. Images may not be lifted from the document and used as clip-art or in any other projects or products. *Copying materials by Illumismart for more than one teacher or classroom, or for an entire department, school, or school system is prohibited. This product may not be distributed or displayed digitally for public view, uploaded to school or district websites, distributed via email, or submitted to file sharing sites such as Amazon Inspire.